Exstora is a Portable Note Manager and Portable Day Planner. AKA: Portable Personal Organizer. 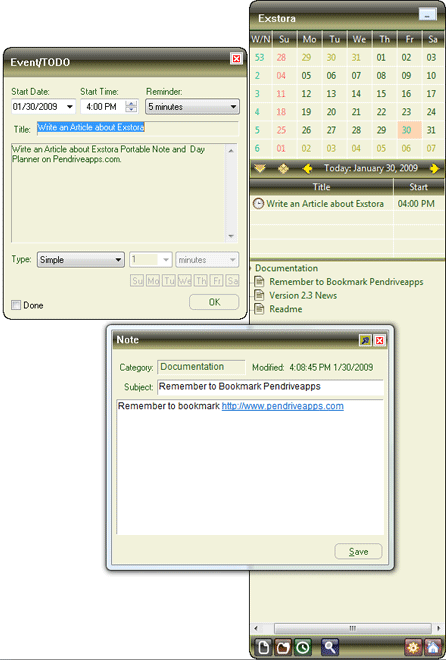 Available in both the Pro and Freeware versions, Exstora enables it’s user to keep track of daily and upcoming events via a built in calendar. Users can also jot down daily reminders, thoughts, contacts and other random notes. Moreover, reminder functionality is included, that tells the software to remind you of an upcoming or scheduled event.